Historical Excerpt: “The Hell Hart, that was what she was called over two hundred years ago. Two centuries ago, no one would have believed she would be tending someone near to death, praying for their recovery. Then, her reputation as a swords-woman, in an age where women did not use a sword was legendary. Her skill with it, impeccable, her dueling record, perfect. After a time, her travels would make her master of many weapons and nearly as many enemies. If you saw her standing over the body of someone, it was to watch the light go out of their eyes in that final darkness. Driven regularly from her home, partially from her strange, ageless and impertinent nature, partially from the fear and responses her enemies had, she acquired a number of names over the decades. In civilized lands, she was The Lady Hart or Frau Hart. In places where she was a warlord, she was known as The Red Hart from her standard, a large deer on a red standard. In places where she killed her enemies indiscriminately, she was called The Red Dragon. For a time, she was a revered as a warrior-queen. Powers: Her physical strength is equal to that of ten men and her stamina is virtually limitless due to her connection to the Gaia-force bestowed upon her millennia ago. Her power manifests as weapons and armor of any appearance she desires. Proficient in any weapon, she can create constructs that resemble modern or ancient weapons. Having survived battlefields from Rome to World War II, she can use any weapon she finds. In addition to her warrior skills, she can channel magical energy for a variety of effects both offensive an defensive. As an agent of the Equinox, she can utilize powers both Light and Dark and is also able to teach mystic arts to those capable of learning them. Psychological Profile: Ms. Hart is one of the last Warriors of Light. Her dedication to the protection of the Equinox and to the Sergeant were absolute. Knowing that he would eventually be resurrected is the only thing that keeps her focused on the task at hand. A resolute and highly skilled warrior with hundreds of years of combat experience, she is completely without fear and almost without remorse. Atrocities perpetrated during World War II and her subsequent death there, left her transformed from her darker aspect. She has worked for the Light and Gaia since the early 60’s. 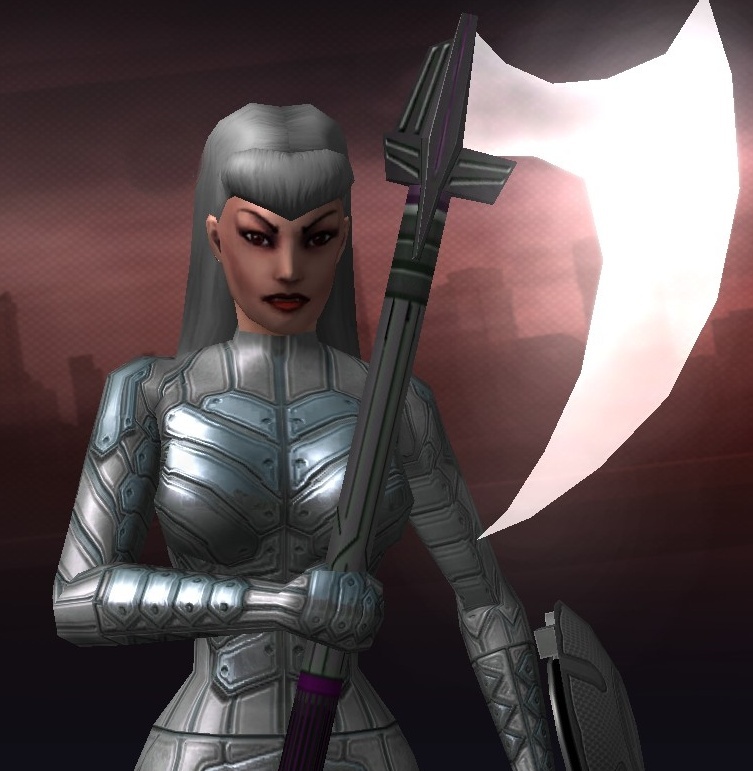 Artwork: Created by Thaddeus Howze, using the City of Heroes Character Creator.